Crews pre-treated roads, but have to continue to work around the clock to get streets clear after freezing rain and sleet fell overnight. KANSAS CITY, Mo. 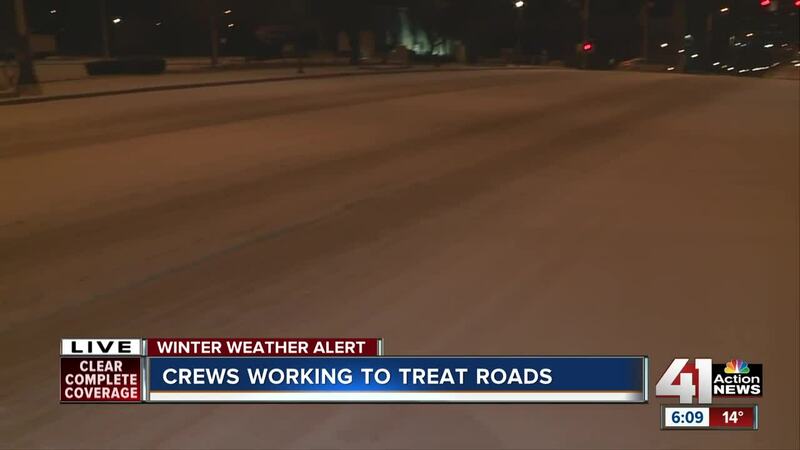 — Crews all across the greater Kansas City metro have been working around the clock to treat the sleet-covered roads. And they're not done yet. Shawnee, Kansas, Public Works state crews were out Tuesday pre-treating the roads and treating again after the freezing rain started to come down Wednesday afternoon. Shawnee, along with other city crews, such as Raytown, Olathe, Overland Park, Gladstone, North Kansas City, Lee's Summit and Kansas City, Missouri, to name a few, were pre-treating the roads ahead of the storm. Several municipalities will continue to be out Thursday, treating the icy road conditions. "We've done our primaries and our secondaries three times with salt and calcium chloride," Lee's Summit Public Works Director Bob Hartnett said Wednesday. "We're in the process of treating our residential streets for the third time right now." There are various chemicals crews will use to treat the roads. "With how corrosive chemicals are, we add an anti-corrosive, a corrosion inhibitor to any of our liquids, just to help with the maintenance of those vehicles so hopefully it won't be as harsh on their vehicles, but still get the same benefit and the melt on the roads," Olathe Street Maintenance Superintendent Chad Courtois said. Hartnett said in Lee's Summit, they use a mix and match various products. "The lowest level is rock salt, and that's what we're putting out on the road right now. We can also speed up the melting process by adding various chemicals to it," Hartnett said. "One thing we do is that we use a lot of is salt brine. We take rock salt, we mix with water, and that actually helps activate the process and get it going on a little bit earlier. Another chemical that we're currently using is calcium chloride. We add that to the salt and it helps speed up that process." Crews across the metro have not had an issue with salt supply. Several mentioned they have enough salt to last them through the winter. "We've gone about 5,000 tons so far, we have about 1,000 tons left, but we've been in the process of reordering salt and we're currently getting deliveries," Hartnett said. In KCMO, spokesman Chris Hernandez said if they have a surplus, they'll sell it. "Every year, we have a contract that brings in the salt that we need before winter starts," Hernandez said. "In fact, many winters we have enough salt leftover at the end off the year that towards the end of the winter, we sell it off to other municipalities." The main focus is on the primary roads, and then crews will focus on secondary and residential streets. If you do see salt trucks or snow plows in the roads, stay about six car lengths back.